When this arrived in my email I was pretty much delighted. I'm a big fan of anything that turns the expected around. And we live in a community of the unexpected, but this one is a very big unexpected. In fact it's 777 Cat truck size unexpected - and it's pink. But it's not just a pink truck going on here, although the pink truck is pretty darn intriguing. 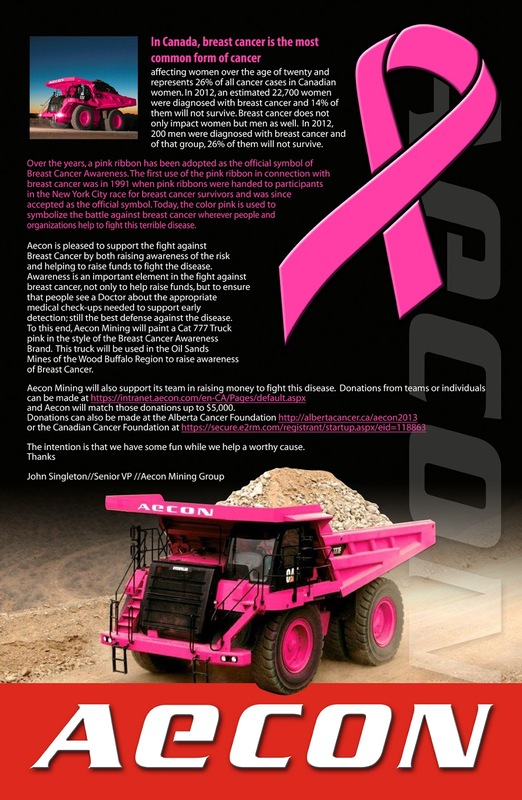 Aecon is raising awareness and funds for fighting breast cancer. I suspect most of us have been touched by this disease in some way, and so the opportunity to donate to fight the disease is sure to attract attention - much like a ginormous truck painted pink will. I hope we will see photos of this truck at work on the oil sands sites, as I'd love to see it juxtaposed against a backdrop of oil sands. I think this truck will certainly stand out and both draw attention to the reality of breast cancer and elicit smiles at the unexpected sight of an enormous 777 truck - painted pink. If you want to see a giant truck painted pink work in the oil sands - and raise funds for breast cancer - then you can donate here. Personally I can't think of a better cause - or a better reason to paint a truck pink.